Tomorrow, Bud will share the last of his letters to Matthew. “I promised Matthew as he died in my arms that I would work hard to cause good to come to other people because he lived and that I would use every opportunity God gave me to share His goodness,” Bud says. For further details about Matthew’s Hope, you can reach Bud at budhanley@att.net. Today is Saturday and I have experienced a parent’s worst nightmare. I had to bury you today. On Wednesday, December 18, 2002, your Mommy and I went to NYU Medical Center at 6:30 to begin what would be the hardest day of our lives. It began with Mommy waking up around 5:00 with a temperature of 100.6. Dr. Young had told us that if her temperature was 100.4 or more, he wouldn’t do the procedure. Mommy was determined to get you all the help she could, so she took two Tylenol and took a cold bath to lower her temperature before we got the hospital at 6:30 . . . When we arrived at the hospital . . . Mommy even put the thermometer on top of her tongue to keep Dr. Young from knowing she had a temperature. Around 7:30, they came for your Mommy to take her down to the operating room. My wait began. Around 8:30, they brought her back to monitor her One of the nurses touched her and knew she was warm . . . She was having some contractions. Fear struck both of us. We just knew that Dr. Young would cancel the procedure. We had come so far and it sickened us to think that after all we had overcome, we wouldn’t get the help we so desperately wanted for you . . .
After 45 minutes of monitoring, the contractions stopped . . . so at 9:45, they took her back to the operating room again and began the procedure . . . One hour passed, then two. After the third hour passed, I began to get worried. Then at around 1:00, I received word that the procedure and recovery was over and that I could see her. When I arrived, she was still very groggy and she was complaining of severe pain in her left hip . . . Dr. Young had told us to expect some contractions due to the procedure, so when they started, we weren’t worried about it. This continued, getting progressively worse . . . very painful and more frequent. I realized that my worst fears were coming true. By 3:00, Mommy was in full-blown labor and we knew that you were coming. I began to pray like I’ve never prayed before . . . By 3:30, we were whisked into the operating room and the miraculous process of preparing for you began. They not only had to prepare the room for your birth, but also a neonatal team had to be assembled to care for you immediately after birth. There had to be 20 or more people there awaiting your arrival. At 3:44, you were born. Your tiny body emerged from a breech position. The team of doctors desperately began to work with you. As they worked with you, you pee-peed and pooped. This was encouraging to the doctors and to us. They then took you up to the neonatal intensive care unit and continued to work with you. Mommy had already instructed me to leave her and stay with you wherever they took you and I promised her I would. But they wouldn’t allow me to go with you. They said they would need an hour or so to get you stabilized and get everything done to help you. I reluctantly consented and waited with Mommy . . . Finally, about 5:00 they came and told us we could see you before they did the next round of x-rays and procedures to check your lung development. When we saw you in the NIC unit, we both cried our hearts out. 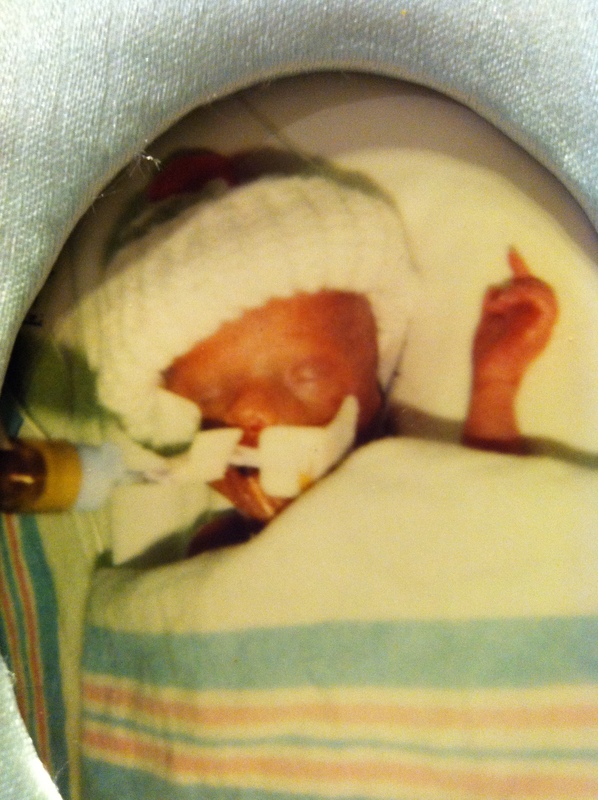 You were so very tiny and you were having to go through so much to try and live. Your Daddy’s heart was shattered. I would have gladly accepted everything you had to endure if I could have. We spent only a few minutes with you and then we had to leave so they could continue to help you. We returned to the room to wait some more. Finally about 10:00, Dr. Edith McCarthy, the neonatologist who was in charge of your care came to our room. Her face clearly showed that she was about to give us bad news . , , Until then, I hadn’t even entertained for one second the possibility that you would be anything but fine . . .
As Dr. McCarthy began to speak . . . she told us that there was not enough oxygen getting to your brain and other organs and that the chest x-rays revealed that your little lungs had not developed. She told us that there was only one other thing they could try. It was a high-speed ventilator that may help and it may not. She told us that, due to the high speed, it could violently shake you and could cause bleeding in the brain. That’s where we had to stop and leave it all to God. Mommy and I had to make the decision that no parent should ever have to make. We had to remove the ventilator that was keeping you alive. At around 11:00, we went down to the NIC unit and Dr. McCarthy arranged for a private room for us to be able to hold you and spend some time with you. She had prepared us, saying that you would likely only live a few minutes. They brought you to us and we held you and cuddled you. We talked to you and told you we were with you and that we loved you. We called Papa and Nana, Papa and Grandma and Great Granny. They all spoke their love to you. I believe you heard them. As your Papa cried and prayed, he begged God to take his life right then and spare yours. As I heard him pray, I knew that that was a prayer that only a parent could pray. I felt so sorry for all of your grandparents . . . After everyone had spoken to you, I held you close to my face and wept. As I walked with you and rocked you in my arms, I told you how much you meant to me and how I loved you. I told you that it was okay to stop fighting. I was speaking words to my only son that I never dreamed I was capable of speaking . . . I held you as you left this world. I believe God allowed you to hear us and you somehow knew of our deep love for you . . . Looking back now, I know we could never have endured the pain without the presence of God in that room . . .
You are my son and you will not be forgotten.